• Ready to Eat: Each package contains 9 pre-measured 400 calorie meals. 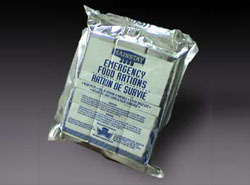 • Allows for on-land emergency consumption in a high-stress active situation. • Contains no cholesterol or tropical oils. • Meets the US Coast Guard standards (160.046/23/0). It's new modern packaging even meets the stringent guidelines set by the Department of Defense (SOLAS 74/83). • Enriched with vitamins and minerals exceeding the RDA requirements. • Pleasant lemon flavor which appeals to everyone. • Mainstay meets the dictates for Halal..
• Ready to Eat: Each package contains 6 pre-measured 400 calorie meals. • Ready to Eat: Each package contains 3 pre-measured 400 calorie meals.